1. An older neighbor woman with a busted up leg who can barely walk her two dogs was attacked by a Black man who was involved in a violent, loud physical brawl with his wife/girlfriend in the middle of the street. As my neighbor hobbled by, the man rushed over to her, started screaming into her face, but she was suddenly more terrified for her dogs than anything, so she started scrambling to keep them close to her. She couldn’t understand a word he was screaming into her face, but as she ducked to pick up one of her dogs, she barely missed the swing of this man’s fist toward her face. Her reaction of shock must have put this man back into some semblance of humanity and instead of swinging at her face again, he stepped back and told her he would “be back in a few days to kill her.” THIS CAME OUT OF NOWHERE in the middle of the day on a disabled, older woman! This kind of random violence makes NO sense to me. 2. Cyprus was on her way home from the subway, walking up to our block, when she noticed a van with its back windows busted out. A car was parked close to the back of van and the van was being unloaded into the car by two Black men. She could tell this was a crime, but kept walking, and as she neared our building, she called the police. It turns out that it WAS a robbery and somebody’s parked van was just being completely emptied of all of its contents. Detectives are coming to our home on Monday night so Cyprus can see if she recognizes any mugshots. She only saw one of the men very clearly, and she is not pointing out anyone unless it is very clear that it is the same man. 3. On the way home from the subway this week, Johnny was on his cell phone talking to a friend when 3 Black teens on a single bicycle rushed him and smacked his cell phone from his ear and out of his hand, smashing to the ground from the force. The phone broke into pieces. Before Johnny could get the main body of the phone back, one of them jumped from the bike and grabbed it up, thrusting his chest out at Johnny to challenge him. Then they all took off… with his phone. Johnny was shocked and then immediately furious and picked up a brick and hurled it at the fuckers, but not in a way that would hit them. 4. Rising up from the street the other day, I heard a woman screaming violent obscenities at someone, “You muthuh fuckn nigguh, I’s gonna kill you, you fuckn muthuh fuckn nigguh! I’ll fuckn rip out yor fuckn throat, muthuh fuckuh!” and this went on long enough for me to get to the window to see what could possibly warrant this kind of screaming on the street. It was a Black woman reprimanding a child as the kid slinked behind her in the shadows of her public screams of violent threats. She remained “talking” to this child in this manner all the way down the street. I don’t know if this child was her son, but she was an adult and he was a child. That’s all I know for sure and it was sickening. I just don’t get it. I cannot wait to get out of my neighborhood, and maybe even Brooklyn. I have grown to despise this element of living out here. Brooklyn is this amazing, wonderful, beautiful part of New York City, made ugly by these attacks that happen weekly in my life to someone around my neighborhood. In Manhattan, I know of no one who has ever been attacked (even though I know people DO get attacked; I just don’t know of anyone), but I don’t think I have met a single person in Brooklyn who hasn’t been attacked in some form. I had a few close-calls in Manhattan, one from a White guy, one Black, and one Hispanic; so I know it’s not a Race thing… people are just people, and people can be violent and stupid, but in my current neighborhood of Brooklyn, it just happens to be a Black thing… or more specifically, a Class thing that is exacerbated by entitlement. What with all of these annoying, subsidized hipsters moving into the heart of an area swarming with government-subsidized project communities, the tension is bound to be raised. Still, there are absolutely no excuses for these random, violent acts, even if perpetuated by economic imbalances. I’m at a loss as to what can be done, but I feel a little defeated for all of us. I hate that I have to worry about my physical well-being, just to go to the grocery store in the middle of the day. I hate that I fear walking my dog in my neighborhood, and that I now just can’t wait to get away from Brooklyn. My relationship with Brooklyn is a bit like dating someone who is neglectful and abusive, but who is so charming and beautiful. 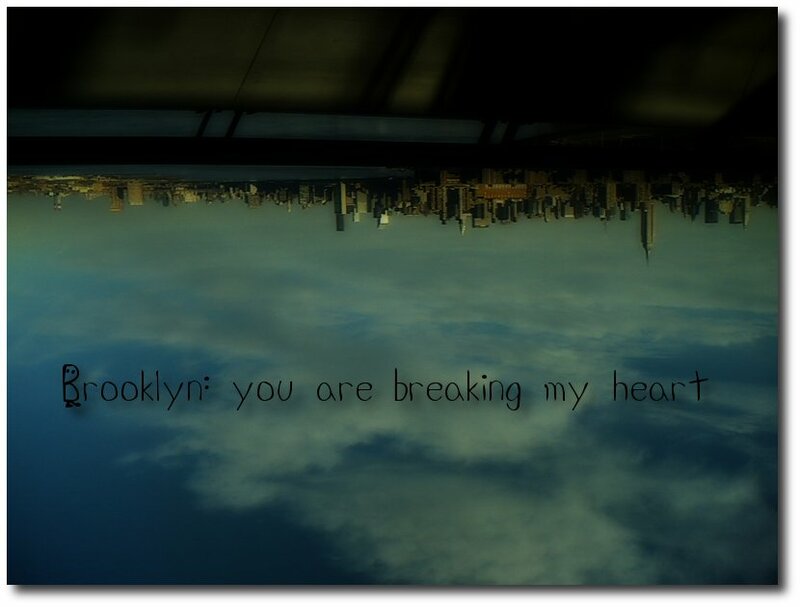 What with my being dumped by Clem, and my friendships with Cyprus and Nick in shambles, there is little reason to keep holding on to my romantic idea of Brooklyn. Previous PostI Need You So Much CloserNext PostAnd I have to Juggle, too! The stories you’ve told… They put my own neighbourhood under new light. I feel very lucky not to live among robbery and senceless beatings. From my perspective, there is only one question: Where. As soon as you figure that out, move! Good luck! Chicago is muthuh fuckn cold! Go to Ft.Lauderdale.